McKee's 37 Carpet & Upholstery Cleaner lifts stains out of carpet and fabric using the latest advanced surfactant technology. Removes the stain without excessive foam or residue! 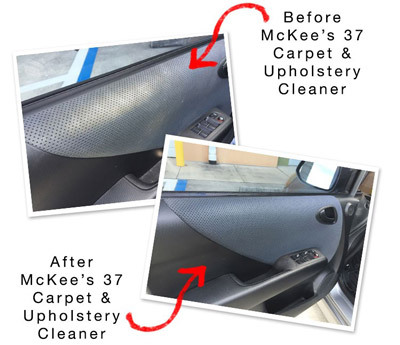 McKee's 37 Carpet & Upholstery Cleaner is a safe, advanced cleaner for auto carpet, floor mats, and fabric seats. Surfactant technology lifts out stains like grease, oil, and food and leaves carpet and upholstery feeling soft and clean. Use McKee's 37 Carpet & Upholstery Cleaner to keep your cockpit looking clean and feeling comfortable. McKee's 37 Carpet & Upholstery Cleaner lifts stains out of carpet and fabric using the latest advanced surfactant technology. Surfactants and wetting agents grab the foreign particles and release them from the individual fibers. They are suspended on the surface of the fibers until you wipe them away. Surfaces will feel clean and soft, never stiff. McKee's 37 Carpet & Upholstery Cleaner will not change the texture or color of the materials. McKee's 37 Carpet & Upholstery Cleaner is water-based and relies on technologically advanced cleaning agents that are safe on fabric and carpet, and safe for you. It contains no harsh irritating chemicals and is VOC compliant. Most importantly, McKee's 37 Carpet & Upholstery Cleaner really works. Unlike most carpet cleaners that are soapy and require rinsing, this advanced cleaner will remove the stain without excessive foam or residue. It lifts, suspends, and wipes clean. Use McKee's 37 Carpet & Upholstery Cleaner on floor mats, door panels, seats, in the trunk, in RVs, boats, and all around the house. It works just as well on furniture and curtains as it does on the carpet. It’s hard to put a price on a carpet cleaner that really works! But you can be certain that McKee's 37 will give you premium results without the premium price. This is one case where you get much more than your pay for! Vacuum the area to be cleaned thoroughly to remove loose dirt. Spray the area generously and work the cleaner in with a vinyl & upholstery brush or a microfiber applicator pad. Allow the cleaner to penetrate for several seconds. Blot the area dry with a microfiber towel. Repeat if necessary. If you used a terry cloth towel or applicator, it may be necessary to vacuum again to remove lint. McKee's 37 Carpet & Upholstery Cleaner requires no diluting or rinsing. McKee's 37 Carpet & Upholstery Cleaner 128 oz. I purchased this cleaner for my truck's carpet, but before I could use it for its intended purpose, I spilled red wine on my beige living room carpet. The only thing I had to remove it was McKee's 37 Carpet and Upholstery Cleaner. It completely removed the stain! I did take work - I blotted up the excess, soaked the area with water and blotted that up, then used the McKees's to go after the deep stain. Spray, scrub with a brush, blot - repeat until the stain is gone. It took a lot of time, but then again I spilled a lot of wine. One thing I noticed is that the cleaner changed the color of the wine from red to blue, but it completely removed the blue color. The blue actually made the smaller stains easier to see. The carpet looks as good as new. This cleaner removed everything thrown at it, so I would definitively stick with this product in the future. ProsA must have if you have kids who will destroy the rear seating! I was hesitant as usual when purchasing this product for the first time. I have been let down over and over again in the past with upholstery cleaners claiming that they will "lift the stains right out!" I followed the directions to a T with this stuff. It worked the first time! I have the black/plaid seats in my '13 GTI. This stuff made them look new again. Pulled a particular stain on the seat out that I had really had problems with before. Overall, I am happy with the purchase! ConsThe smell from the spray. It is VERY strong! I suggest to spray and then vacate the vehicle with all doors open and a fan blowing fresh air into the cabin. Then after a few moments of having time for the air to clear, begin working with a brush or whatever you use. This stuff is awesome!!! I had some coffee stains in my carpet that had been there since....... this stuff removed them, completely, in one application! By now you know when the detailing god like something, it's gotta be the best and this stuff is amazing with a fresh smell. Two thumbs up with a side order of five stars.